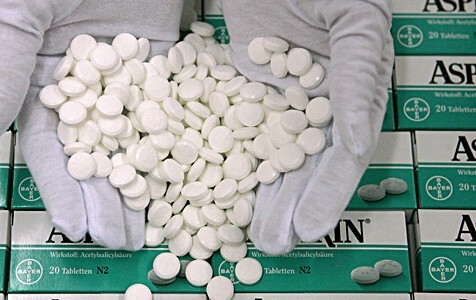 Studies show that aspirin can prevent the risk of heart attacks, strokes, tumors, and cancer. 51 studies on over 70,000 people show that both men and women who took daily dosses had lower risk of dying from cancer. But in order for this to work it is said that you must take it every day for more than 5 years, which is difficult to do for most people. But, by doing this, you may cut the risk of cancer by 37 percent. If taken everyday for three years, you may reduce your risk of cancer by 25%. If taken properly, consecutively, and for a long period of time your chances of developing cancer could decrease significantly. Although the research shows aspirin reduces the risk of getting cancer, it does pose side affects. These side effects include gastrointestinal bleeding, stomach ulcers, ringing of the ears, allergic reaction with other medicine, and anemia. This puts stress on healthy patients. Patients without any health problems may not want to put themselves at risk with these side affects nor do they worry about the problems of cancer. Because of this, taking aspirin may not be a probable solution. The Doctors suggest that aspirin should only be used on medical advice for now until more research shows the safety of the drug and other ways it can be used. Many research papers do prove that aspirin can increase cancer prevention however, not all cancer can be prevented. The cancers that are affected are esophageal cancer, prostate cancer, lung cancer, colon cancer, and colorectal cancer. Aspirin can reduce these by 40-50%. Cancers such as breast cancer though, are not affected at all. So relying completely on this drug does not reduce your risk from all cancers. Other measures must be taken. With this new data aspirin has become the celebrity of the media, however the research done did not directly focus on cancer prevention. The research that was completed focused only on the broad affects of aspirin. Not just one target was followed. In order for this new exciting find to be 100% accurate, more research must be done in order to prove the true affects. Most likely this type of research will be prolonged due to aspirins low cost. Research scientists are having a hard time getting this research funded because the lack of large profit. But it is said for now, that if your history shows evidence of cancer; ask your doctor if it would be safe to take a small dose of aspirin or baby aspirin.